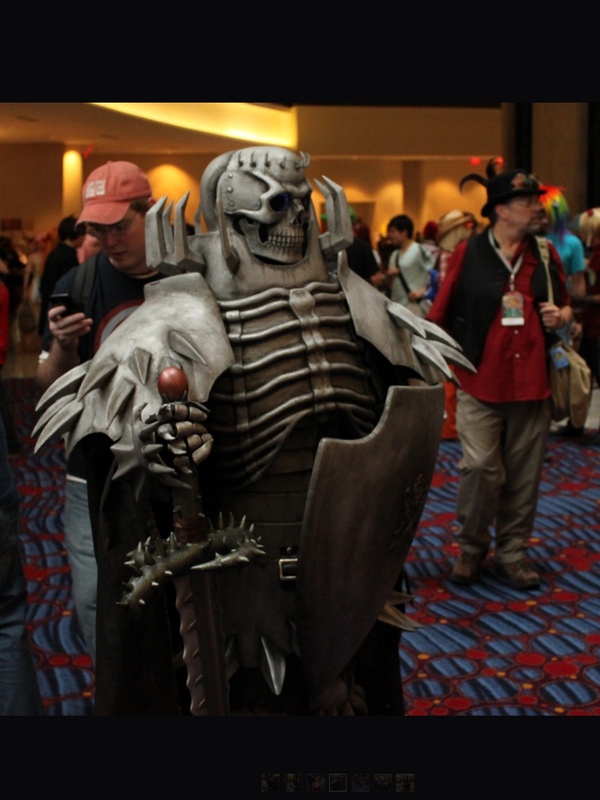 I’ve seen some other cosplay attempts at Skull Knight and they were okay, but I’ll tell you right away here that the secret to the success of this armor build and what sells it is the form or tight fitting of the skull helmet on the head. The others were too large because their helmets were designed to put on over the head, so it had to be large, like a motorcycle helmet so it gave a bobble head effect. 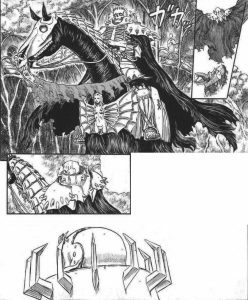 I made my helmet hinge at the top with the natural seam down the side where SK’s (Skull Knight’s) rivets show up giving a slim skull effect like the pages of the manga. 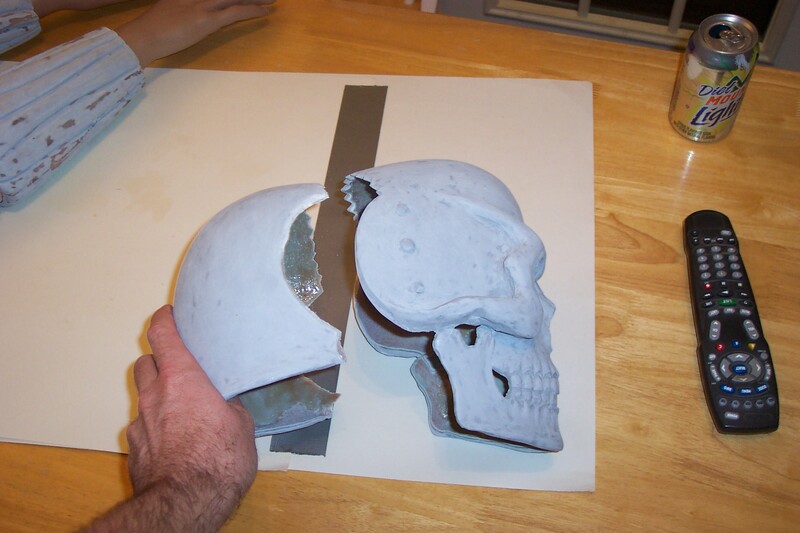 Natural split for Skull Knight helmet on foam mannequin head. 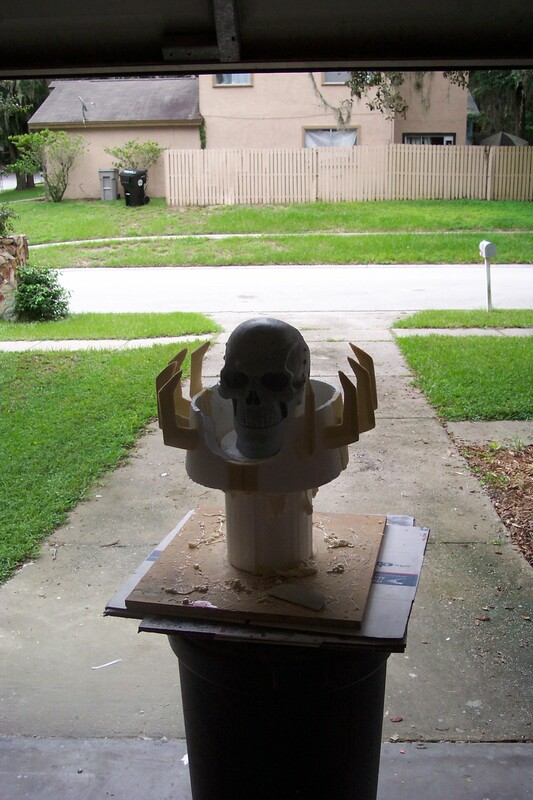 Split Skull Knight helmet before hinge. 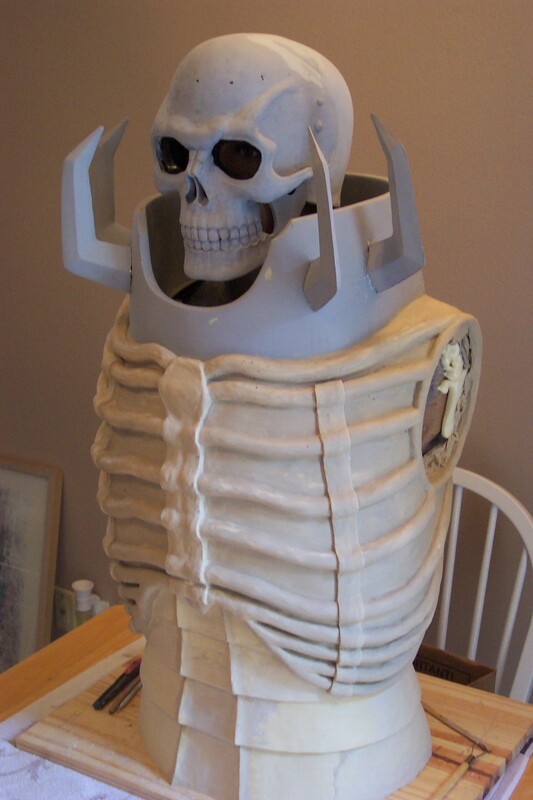 Hinge at the top of helmet for Skull Knight. 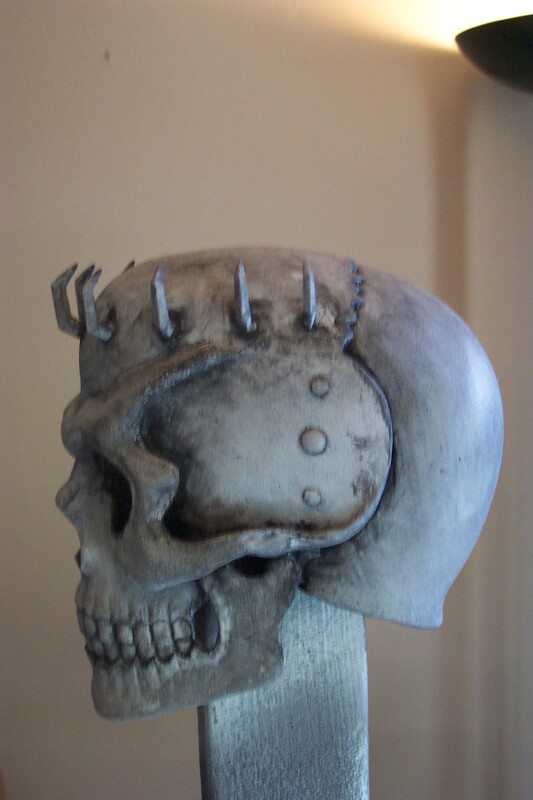 Completed hinged assembly on Skull Knight helmet. 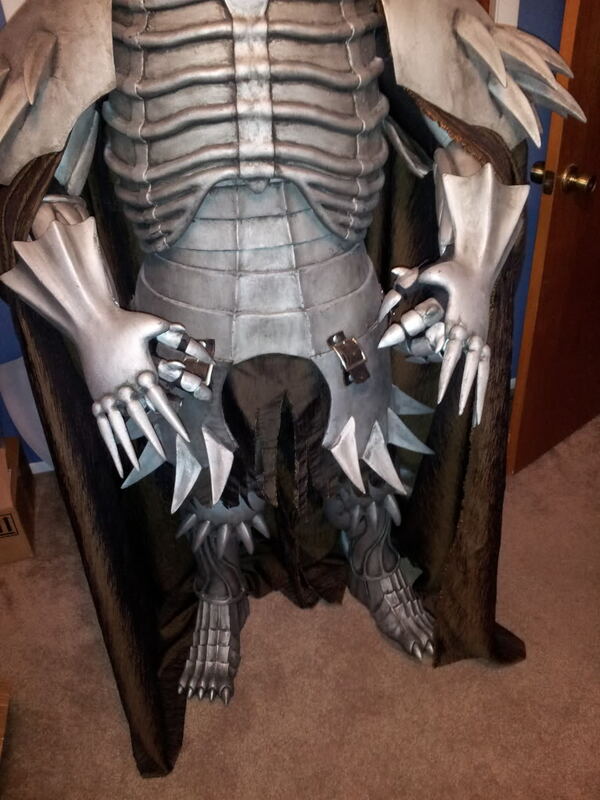 This post is a complete tutorial on building a full armor costume for the Berserk manga series by Kentarō Miura. It is different than my other tutorials where, here, I tell you how I did it instead of instructing you what you should do. I freely confess that this is the more difficult, time consuming, and more expensive way of going about it. So I know most of you wanting to build your own may not go about it this way. The way I chose to build it is how a production company would go about it, maybe, and gives it a higher quality with durability and control of detail. 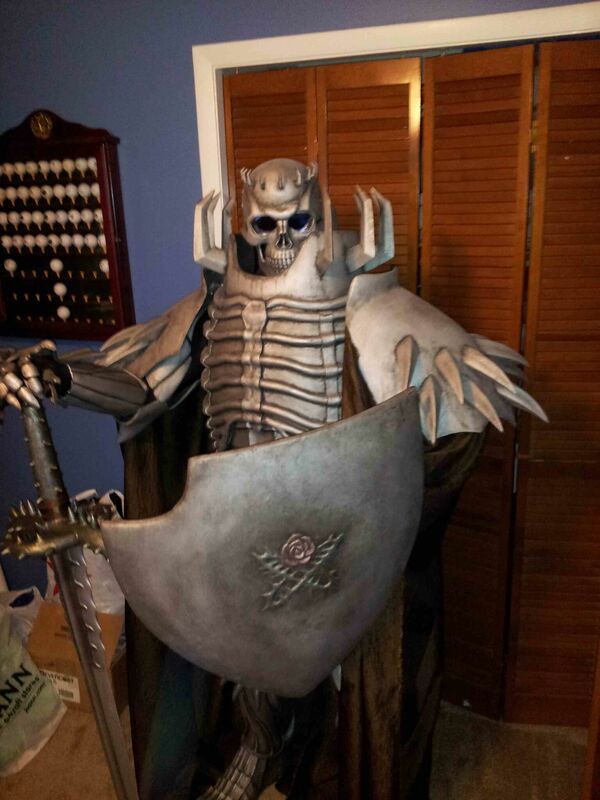 The costume was conceived out of the Life sized bust I and @berserkstatues of skullknight.net collaborated on and produced as a collectible statue. 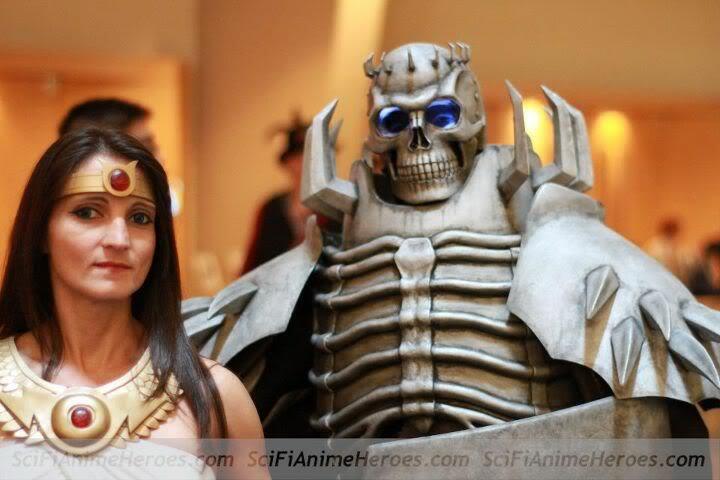 One of the recipients of the bust commissioned me to make the full armor costume build for him to cosplay in. Fortunately for me I had the privilege to test fit it and cosplay myself at a few cons to get the kinks out. Fun Times! 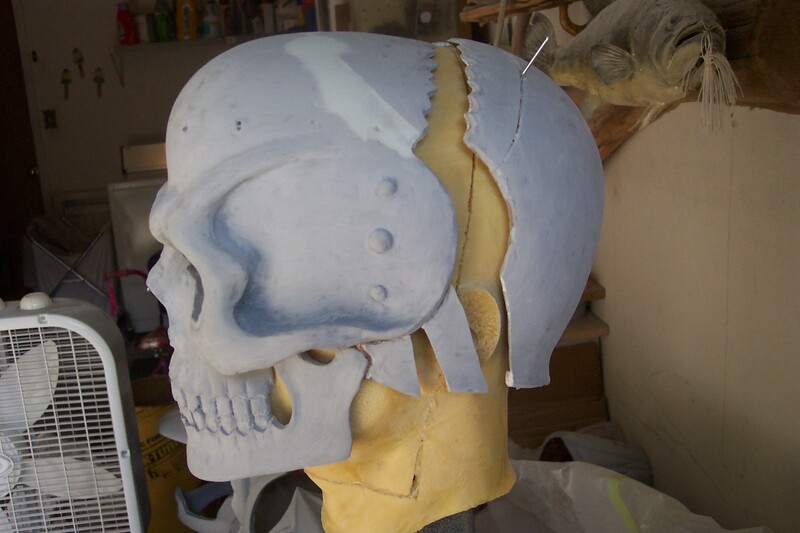 So I’m going to start this tutorial from the skull down since that’s how it began. I’ll update my Instagram account with posts promoting each section as I complete it. If you clicked on a link that took you here and I’m not finished, follow me if you have an Instagram profile and you’ll get updates as I complete each section. I’ll also be sharing on Facebook, Tumblr, and Twitter. 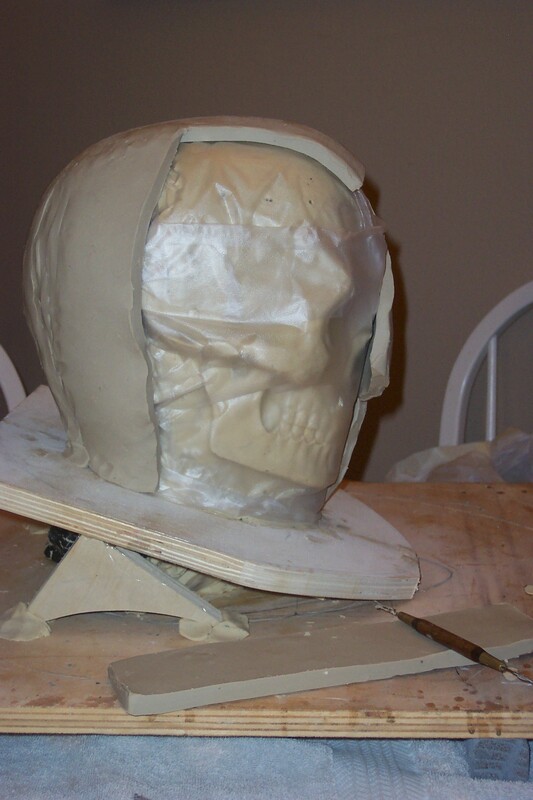 As a trained special effects makeup artist and prop maker I immediately knew that I was going to sculpt the skull and most of the armor out of clay first and then make molds to give me maximum control of detail and function. Again, I know this is not the efficient and least expensive way that most cosplayers would taught about, but it is the way I know best as a professional. 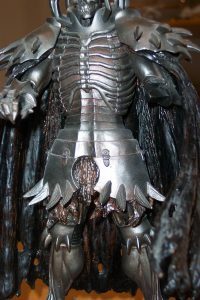 I began by studying the manga and receiving a small scaled statue from Derek of @berserkstatues for reference material and made measurement conversions to life size. 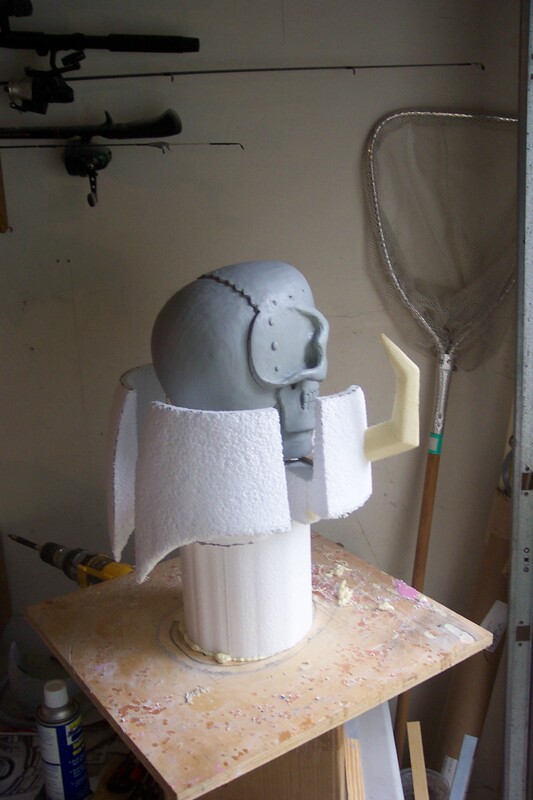 To begin sculpting, I mounted a realistic looking skull prop, as an armature, on a board and began wrapping clay on it keeping some of the shape intact to help me keep defining the skull. 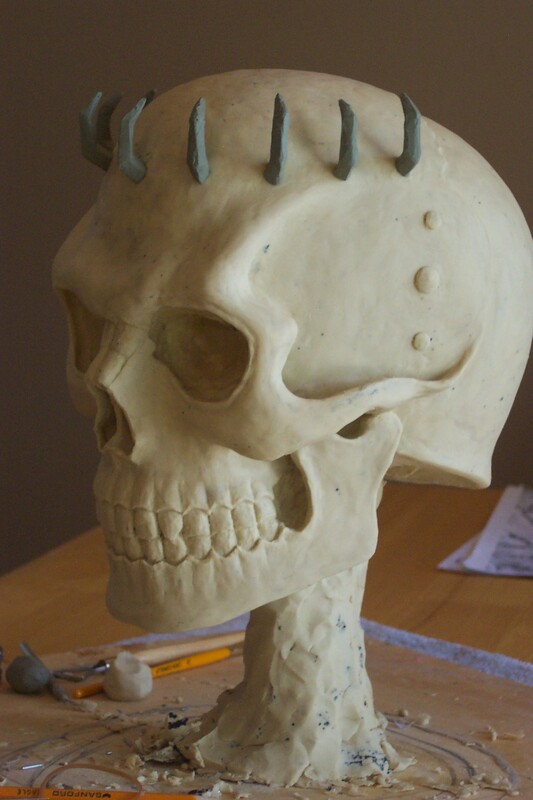 However, it took a lot of clay to get the scaled measurement that the armature skull detailing only helped at the beginning. 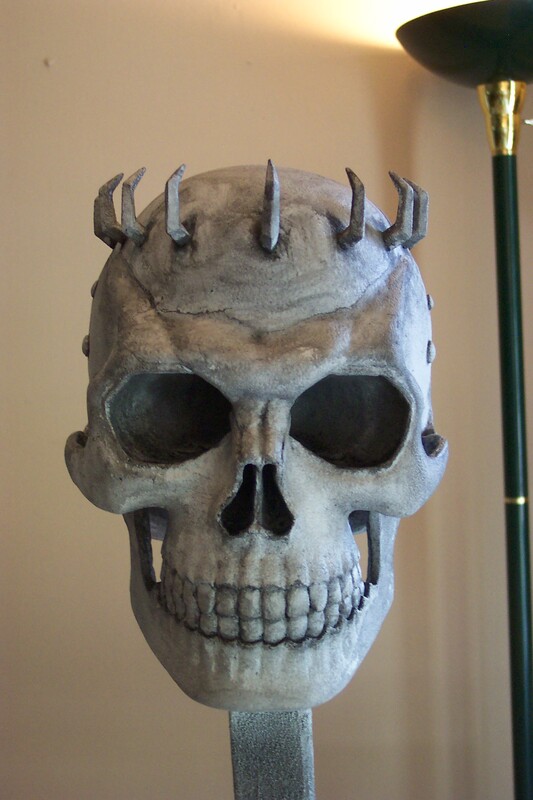 Plus, SK has defining character features, like his brow, that’s separate from a real skull. 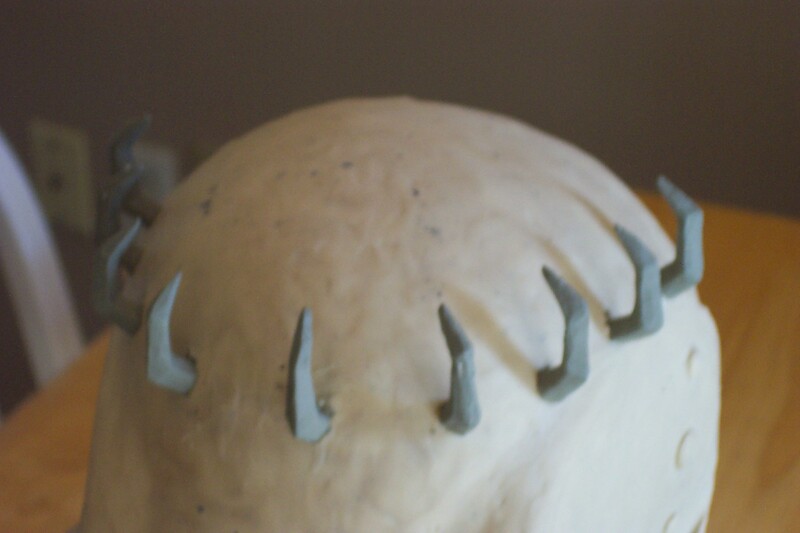 Another recognizable aspect to SK is the spikes on his forehead, which I used a different type of clay, known as Roma #3, that is more rigid and holds detail better. 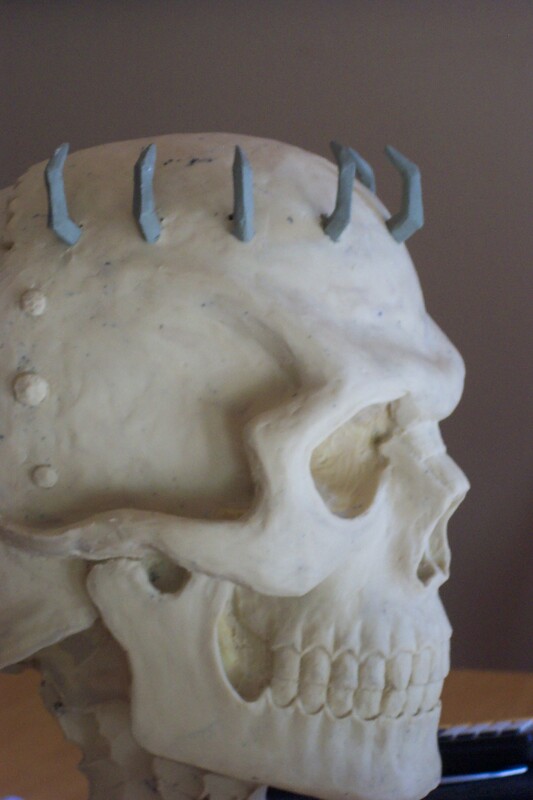 I had to wrap the clay around stiff gauged aluminum wire to maintain the spike shape and stab it into place on the clay forehead. 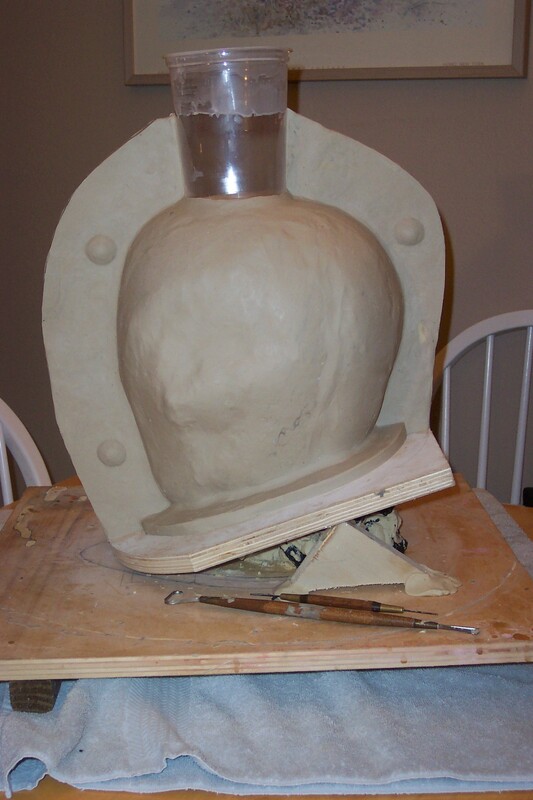 Once I received approval from Derek I then proceeded to the molding stage of the helmet. 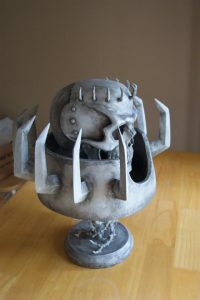 I wanted to begin molding right away so I could then cast a rigid piece from the mold to use for fitting and sculpting the spiked collar, because I know I would have damaged a clay sculpture otherwise. 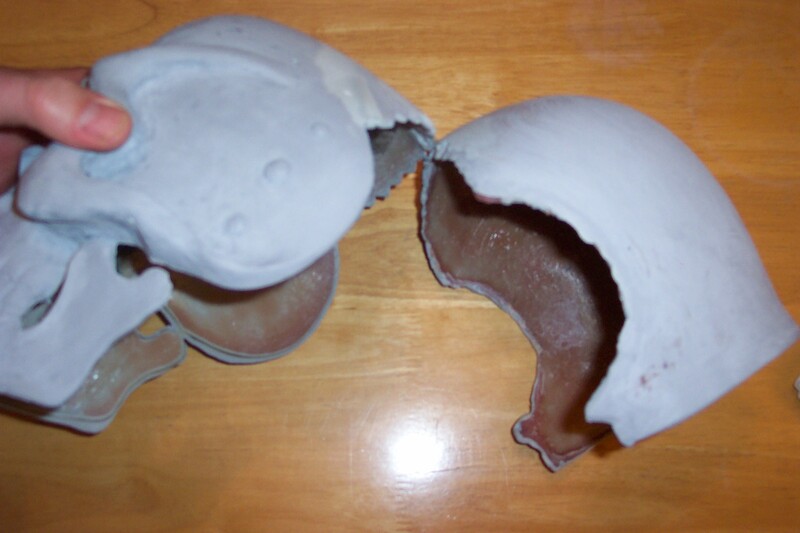 For the skull helmet, I decided to use my case molding skills as I believed it was the best method of molding this type of plug (original sculpture to be molded). If I haven’t done it yet, I fully intend to do another tutorial on case molding alone soon. 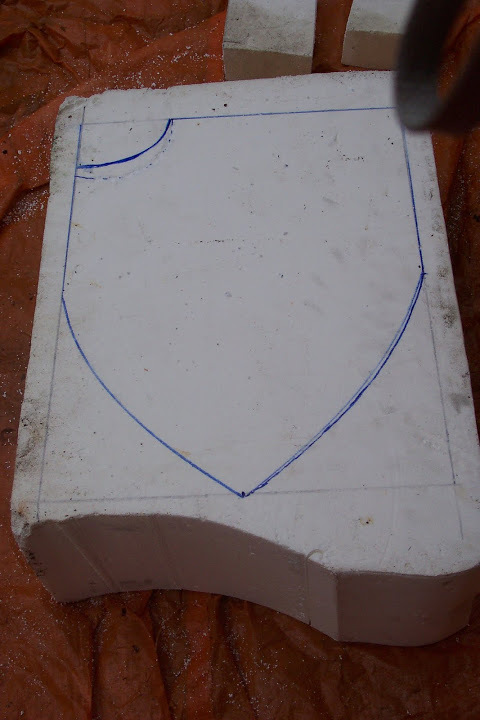 See pictures below for the case molding method. 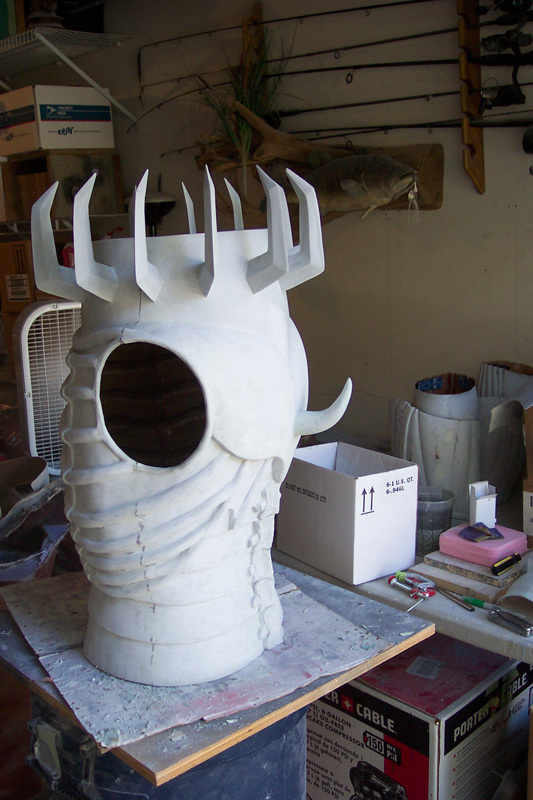 Once the mold was finished and I removed the sculpture from the new mold, I was able to cast a rigid (fiberglass) piece to have for the spiked collar build. 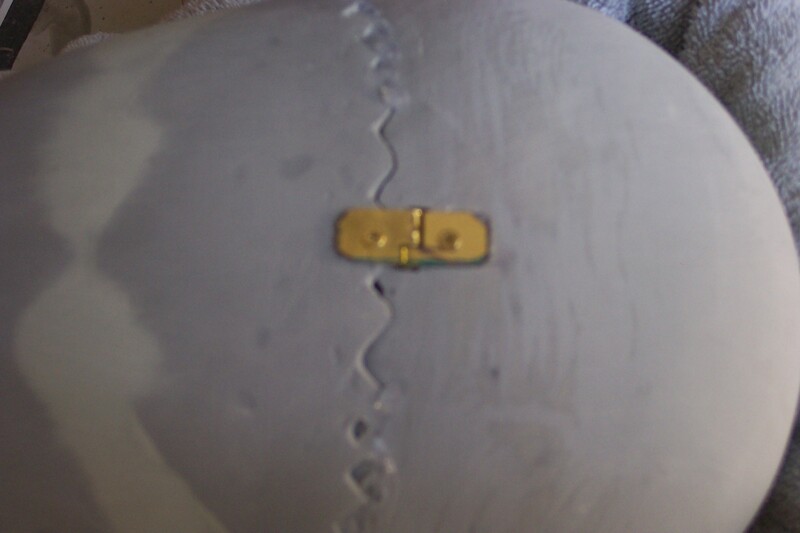 A hard piece was important to keep from damaging a clay, delicate, sculpture had I used it. 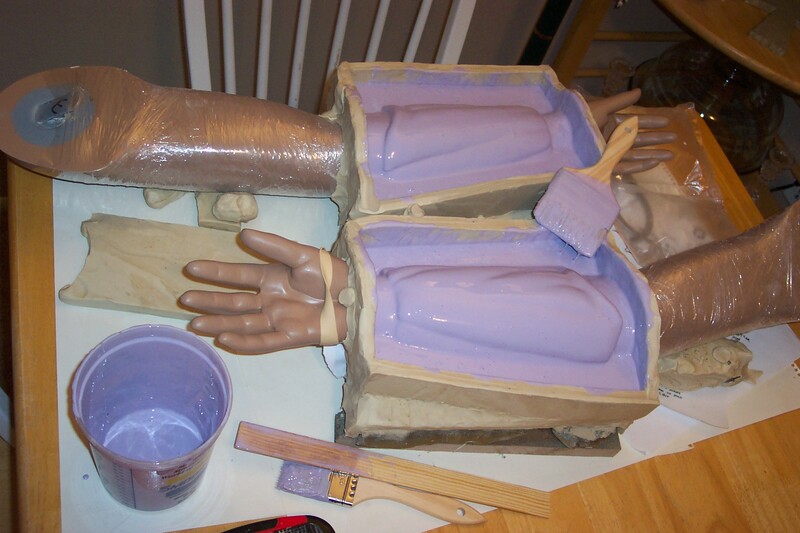 I want to take a little time giving the formula I used for casting fiberglass pieces from molds. 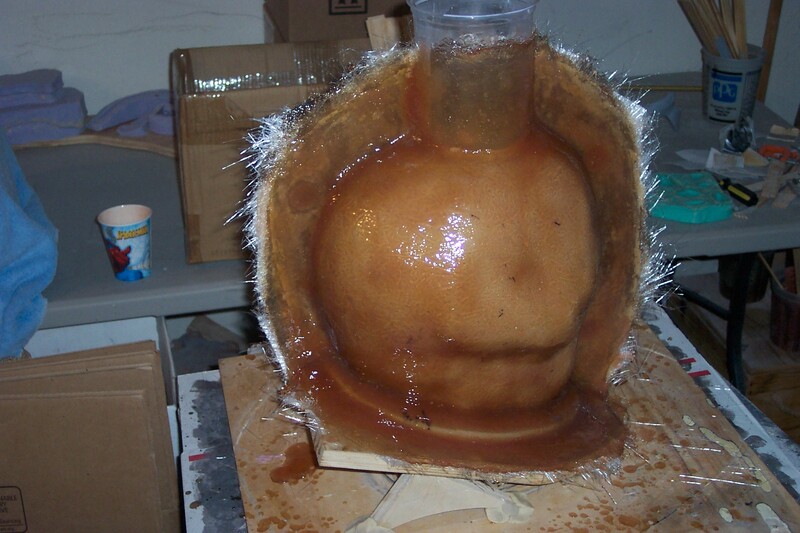 First skim coat inside empty mold, 1 part polyester body filler (bondo) mixed with 1 part polyester high building sandable primer, catalyzed together with each respectable hardener. Allow to cure until gloss sheen is replaced with a dull matte surface. A putty with a pudding like consistency made of polyester fiberglass resin mixed with cabosil/aerosol micro-balloons. WHERE A MASK WHEN MIXING! The putty after mixing and adding methyl ethyl ketone peroxide for hardening is brushed in to smooth out the hard lined detailing of the mold to inhibit air bubbles when laying down fiberglass matte. 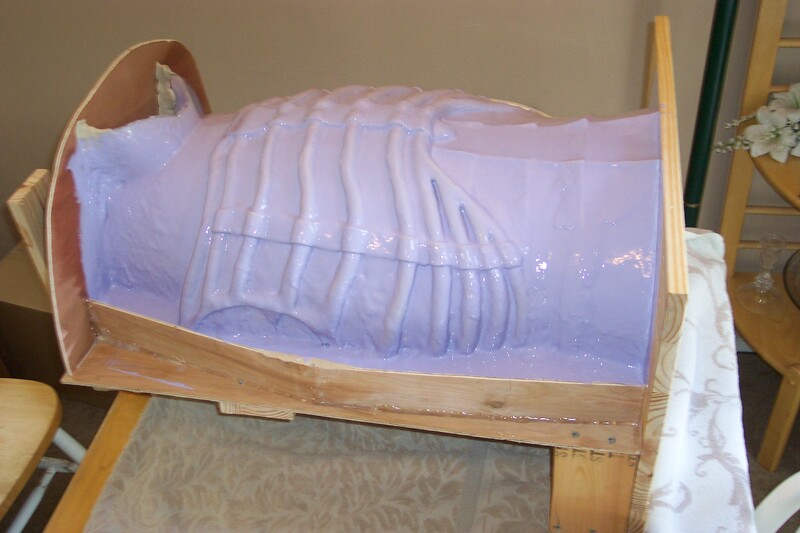 Polyester fiberglass resin catalyzed with the same methyl ethyl ketone peroxide above wetting fiberglass matte sheets and forcing it to lay over top of the inside of the mold with no air between layers. 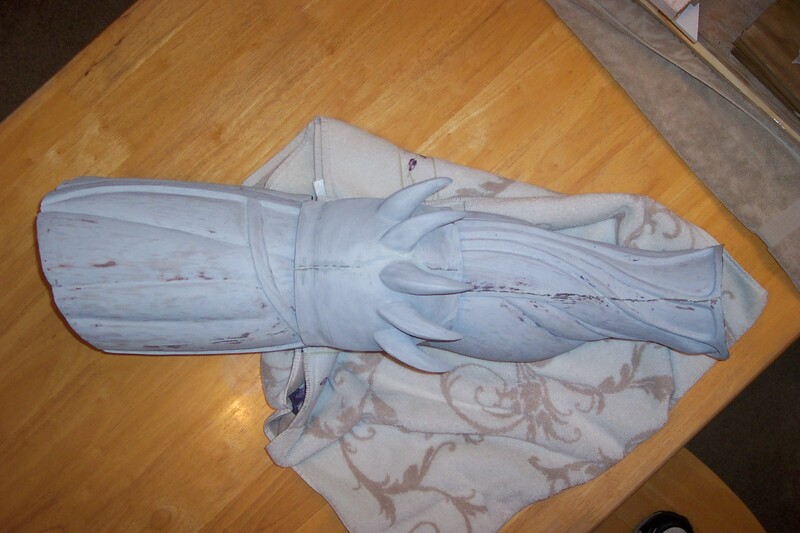 The reason I like to use my mix of bondo/polyester primer first instead of the popular gel coat method is because once I “pop” a fresh piece from the mold I can sand smooth any imperfections from the casting or even my sculpture if I didn’t get all my fingerprints out of the clay sculpt before molding. 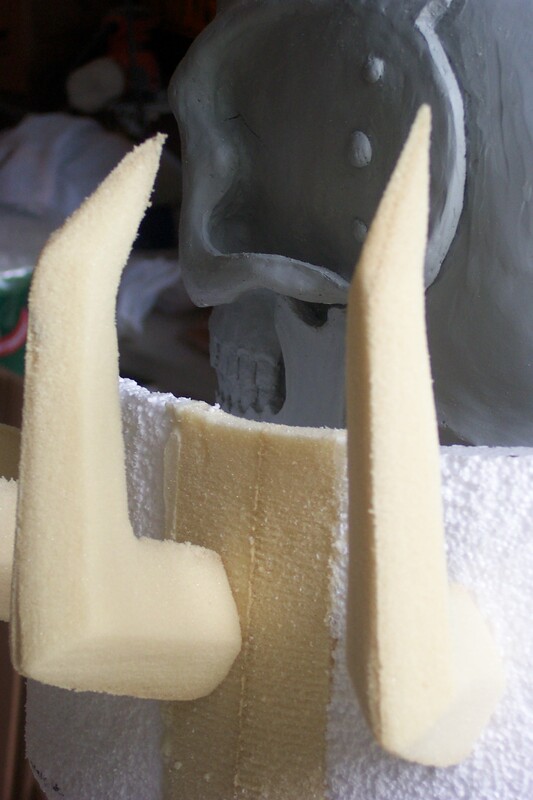 Urethane foam carved spikes around collar for Skull Knight from Berserk. 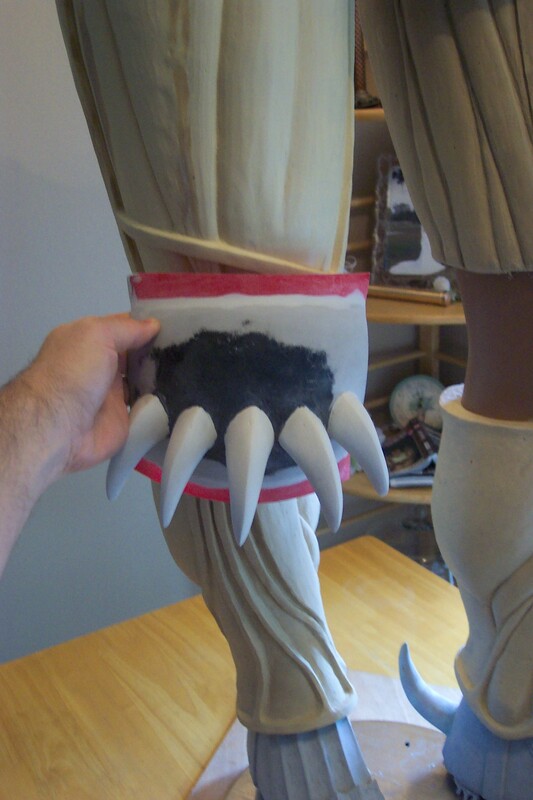 I chose to sculpt the collar and spikes out of foam because most of the surface is symmetrical, smooth and the shapes could easily be captured more efficiently with foam. 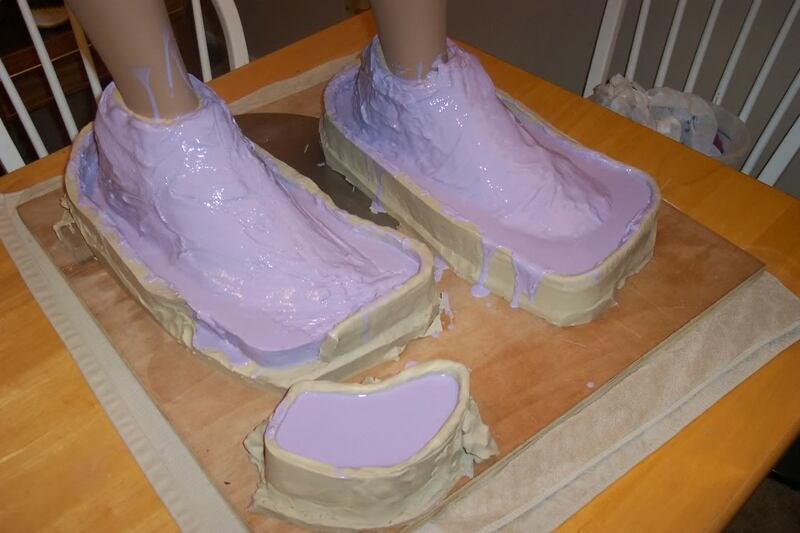 See my blog post on sculpting to see the benefits and tools used for working with foam. 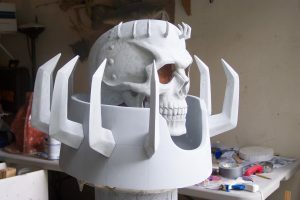 Even though I was able to achieve quick results with the foam, I was immediately slowed down by having to fiberglass and bondo over the foam to get the smooth, hard shell needed for molding. Anyone who has bondoed before knows how much sanding has to be done…this took forever, it seems, bet well worth it to get the desired outcome. 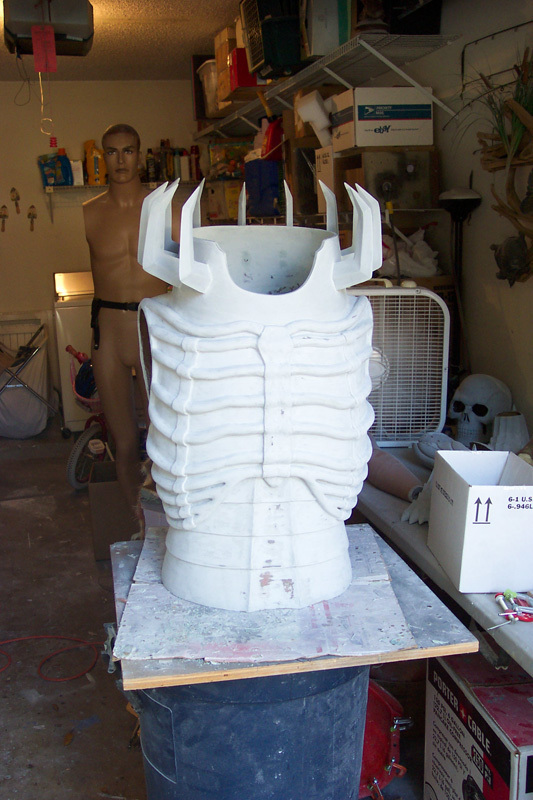 The spikes were to be silicone poor molded, where the collar, I chose to do a hard fiberglass mold. 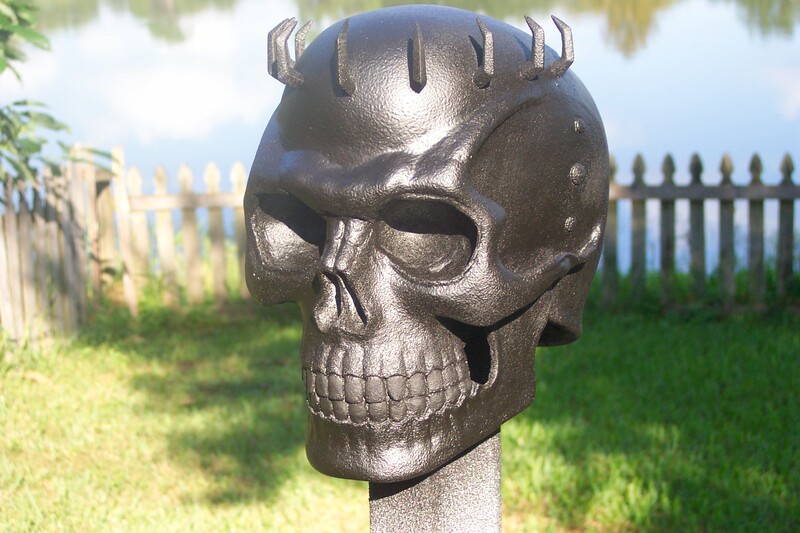 I only molded one of the spikes, since they are all the same. Having a mannequin to build off of is probably the first thing I thought of using to be able to create this costume fully. 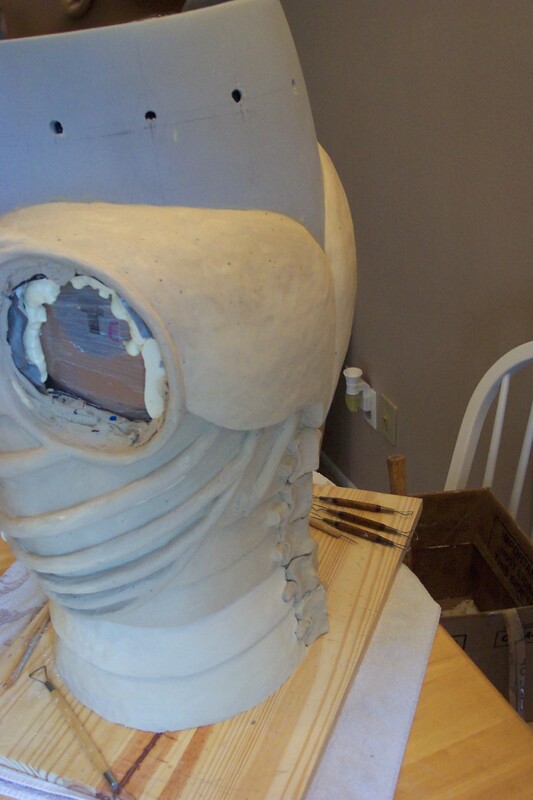 It was important because I could work on other parts of the costume independently from other sections while some armor parts were occupying areas of the mannequin that were being molded. It was also nice to have someway of assembling the costume onto a subject seeing how it would look and function all together. Before I show my progress on the armor any further I thought I’d give you a shot of the new reference I used for scale, shape and style for the costume. I can’t believe the client trusted me with this VERY rare Japanese Toys R Us Exclusive. The statue was never sold directly through Art of War, which goes to show the dedication to the success of the project. 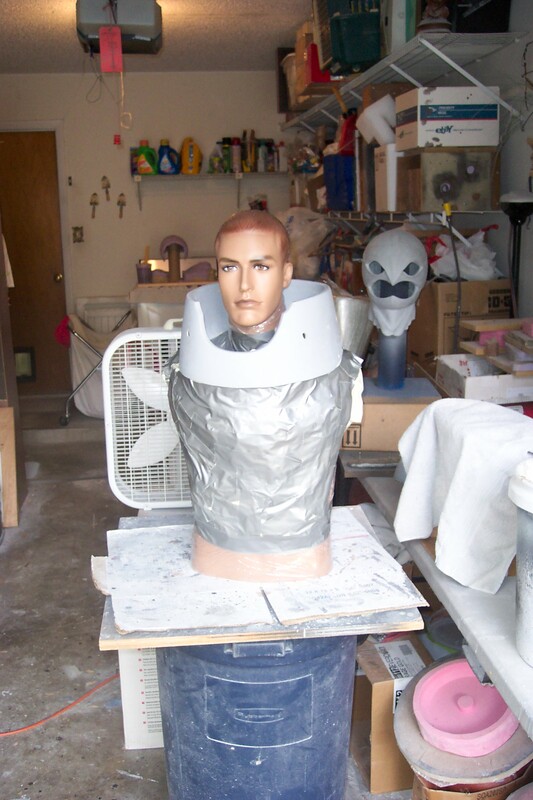 Clay can get extremely heavy when building up it’s thickness for any sculpture, particularly whole body armor, so I began bulking up the mannequin armature with plastic wrap and duct tape to reduce the amount of clay I had to use. Clay can also be quite difficult to remove as it leaves behind a smooth layer as you would try to scrape it off, especially during a hot Florida summer as the clay becomes softer and more sticky. So a pleasant surprise I had by using plastic and duct tape first insured a clean mannequin when complete. 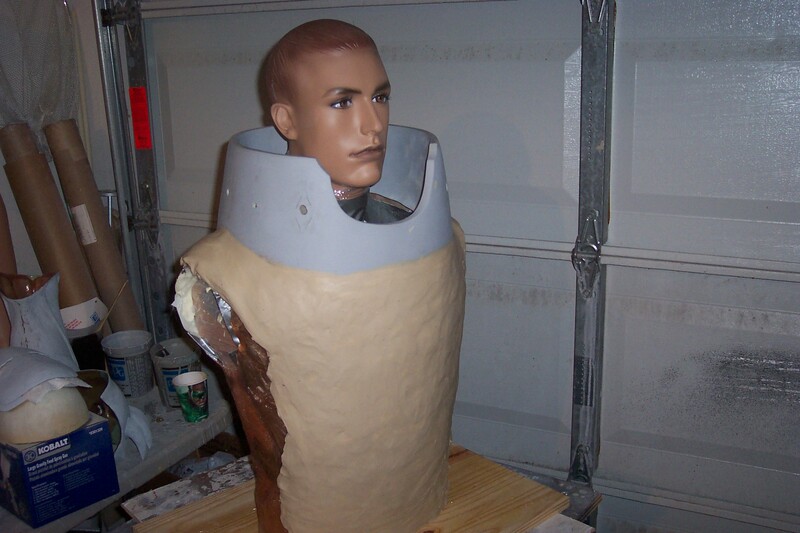 As you can see from the pictures above, I included the fiberglass collar as part of the breastplate and back shoulder armor to eventually be molded as one unit. 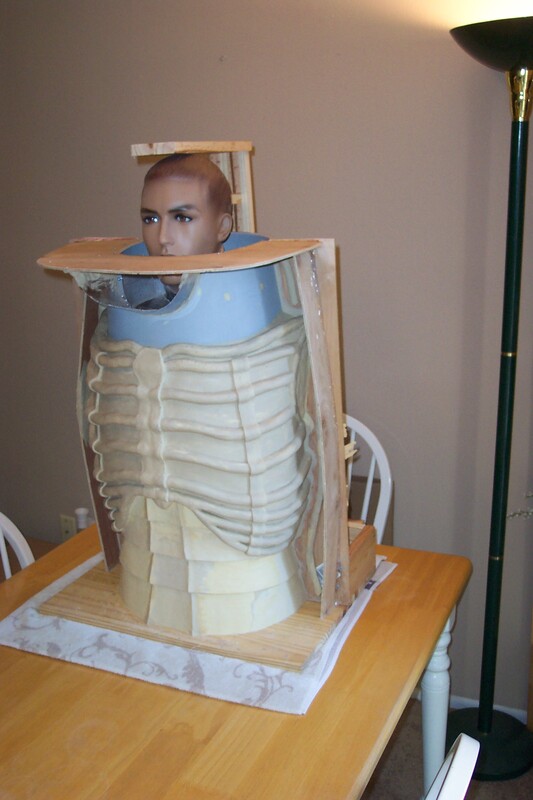 The stomach and back scale armor is part of the solid unit, but after casting it all as one out of the mold, you’ll see how I separated it all as a movable unit. 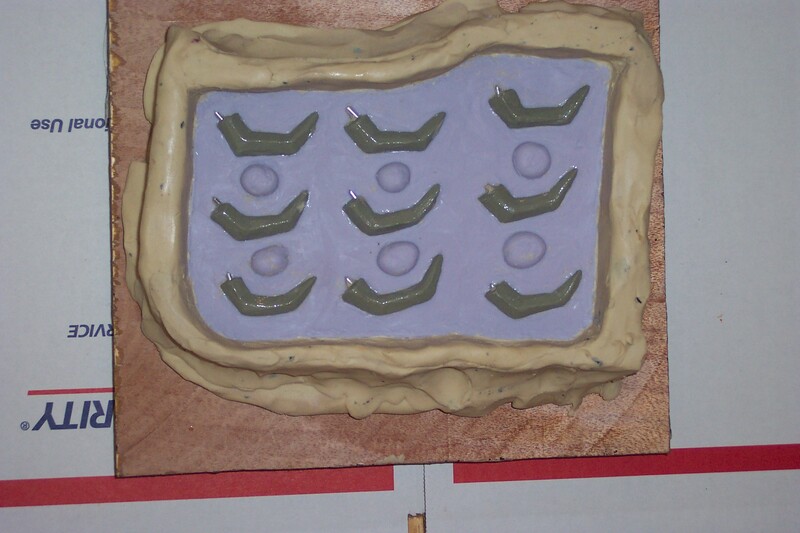 Brush molding with silicone was my choice of capturing the sculpture. See pics below. 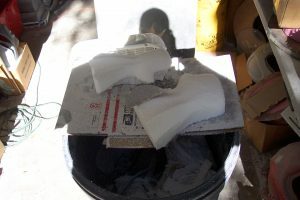 I casted the part out of fiberglass using my formula from above. 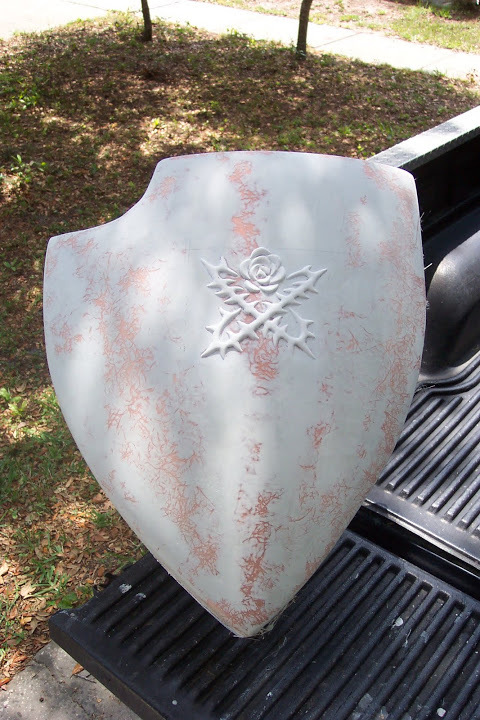 What’s nice about armor builds that may require aging and/or hammered metal look is that the surface doesn’t always need to be perfectly smooth. Sculpting out of clay can leave fingerprints and imperfect surfaces and tool marks during the sculpting process. 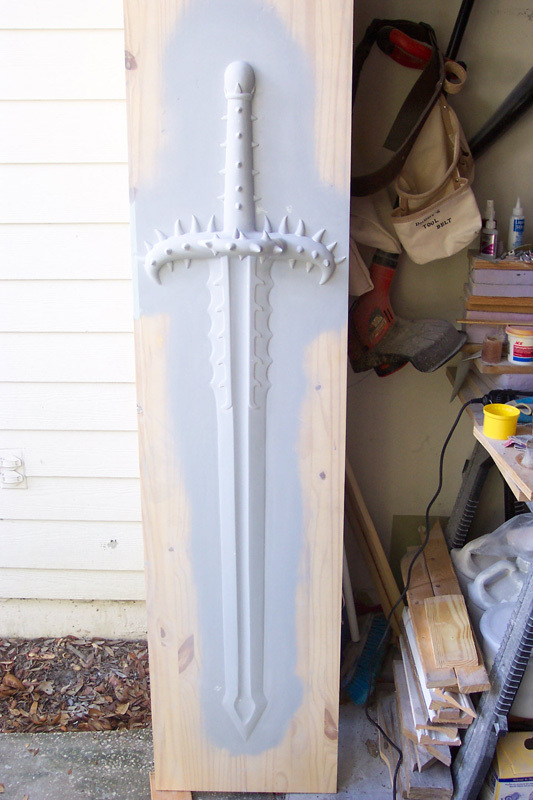 This was my plight and I was able to sand a lot of it off after casting, but I purposefully left some visible for that weathered look which helped me with the paint job as well. 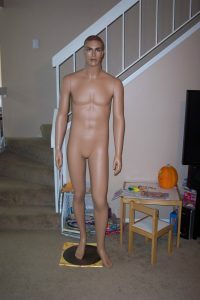 Again, having a mannequin to work off of was a great advantage for me. 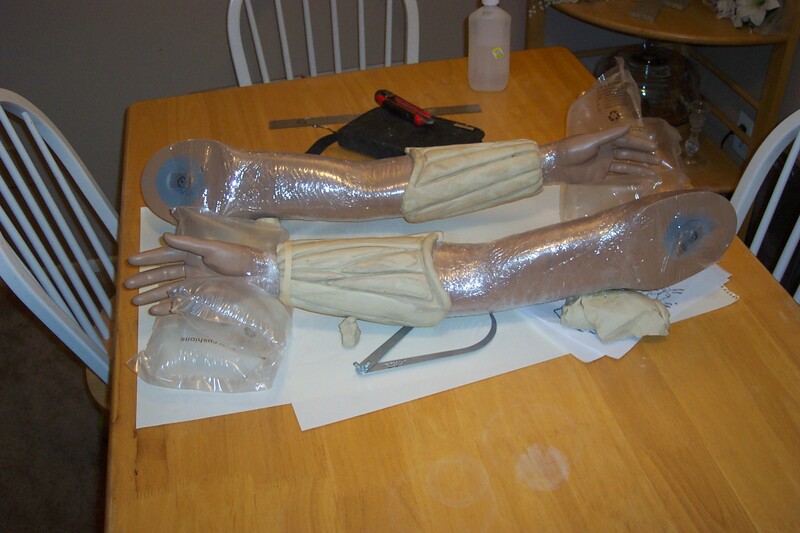 I was able to disassemble him and work on different parts of the costume as other parts occupied his main body. 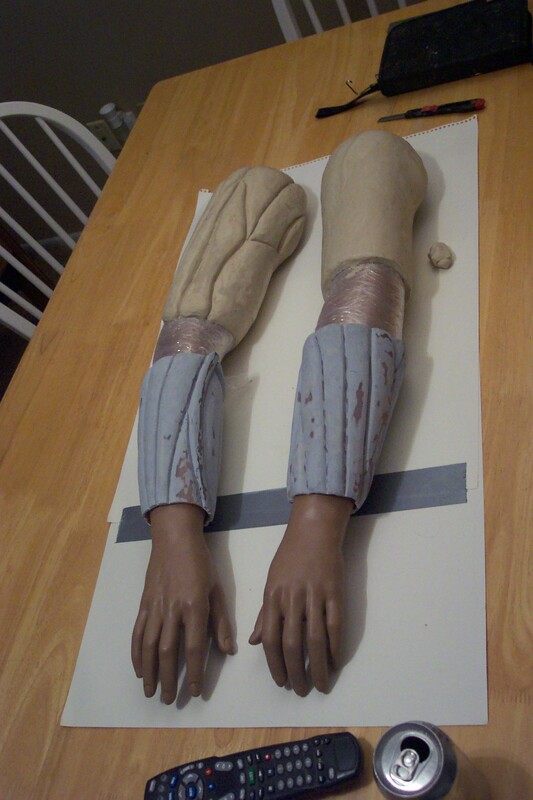 The mannequin’s arms, for example, were small enough that I could work with the sculptures and molds on a table top for ease and comfort. 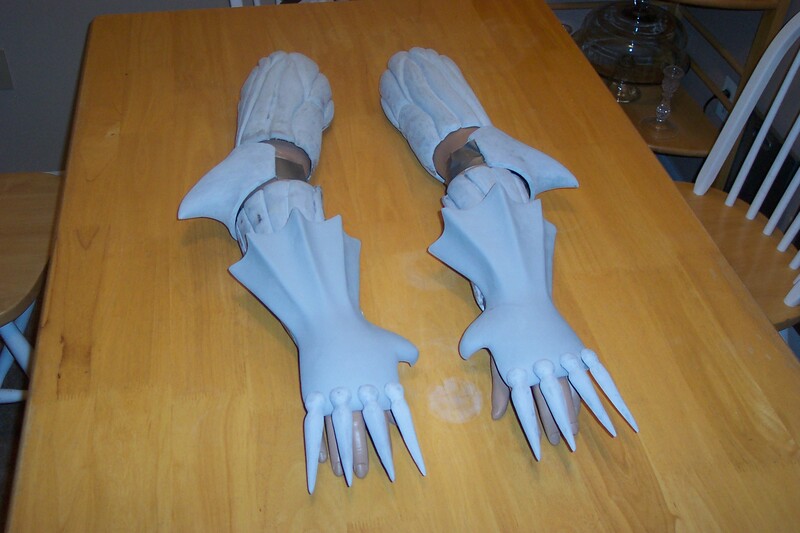 As I completed a clay sculpture section of the arms, like the forearm gauntlet, or the boot armor of the legs, I would immediately mold them and cast a solid fiberglass piece before going on to the next section of the appendage. This was to avoid taking the chance of damaging the finished clay sculpture, had I kept going with clay all the way up. Another words I took it one step at a time. 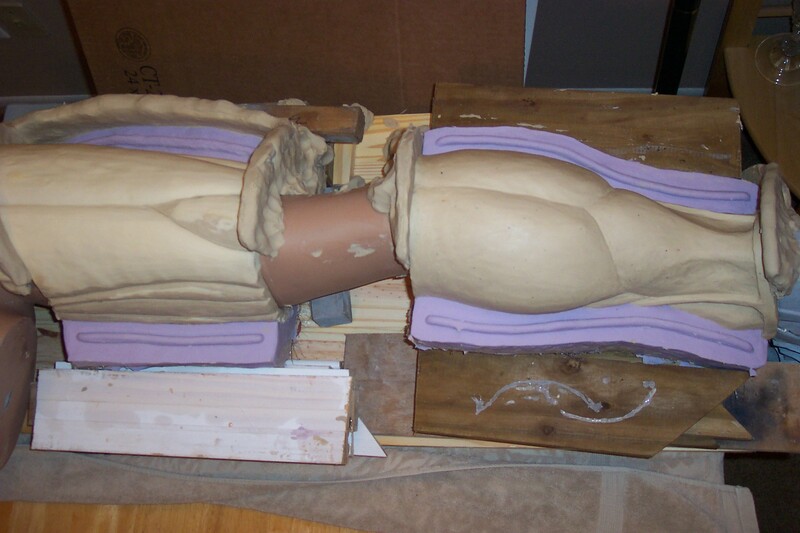 See various stages of the sculpting and casting below in pics. 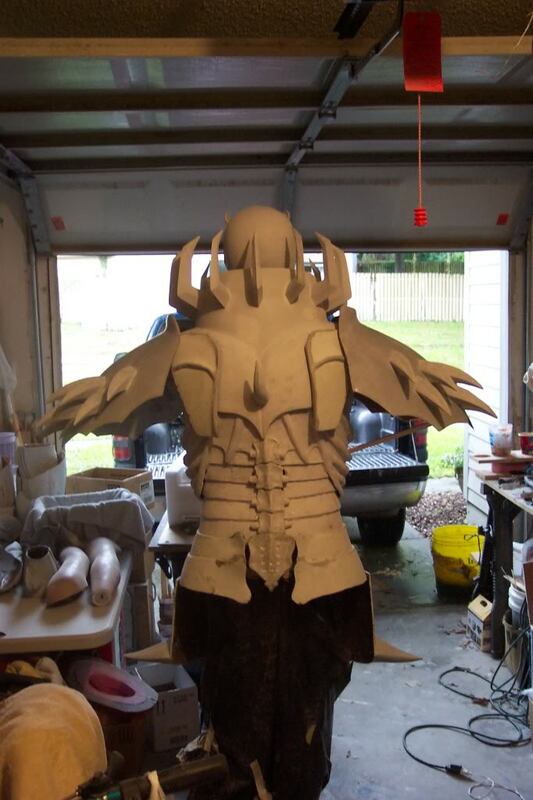 Even though most sections of the armor build started off in the clay stage, I sometimes went with a different material for the original sculpture like I did for the beginning of the spiked collar build. 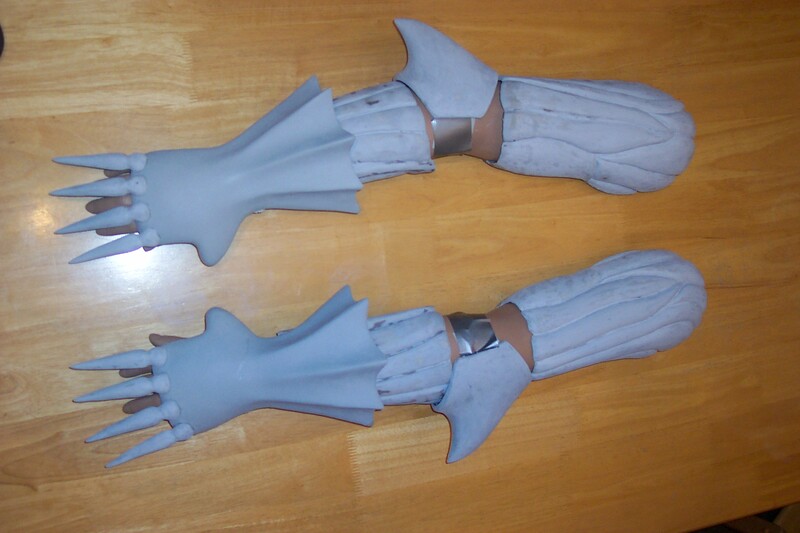 Another section I chose to use something other than clay first is the gauntlets for SK’s arms. White EPS foam gave me a quick shaping, but then I foiled and fiberglassed and then bondoed the surface hard and smooth for molding. The knee guards were fabricated by using generic knee guards I found at a thrift shop in the tool section. 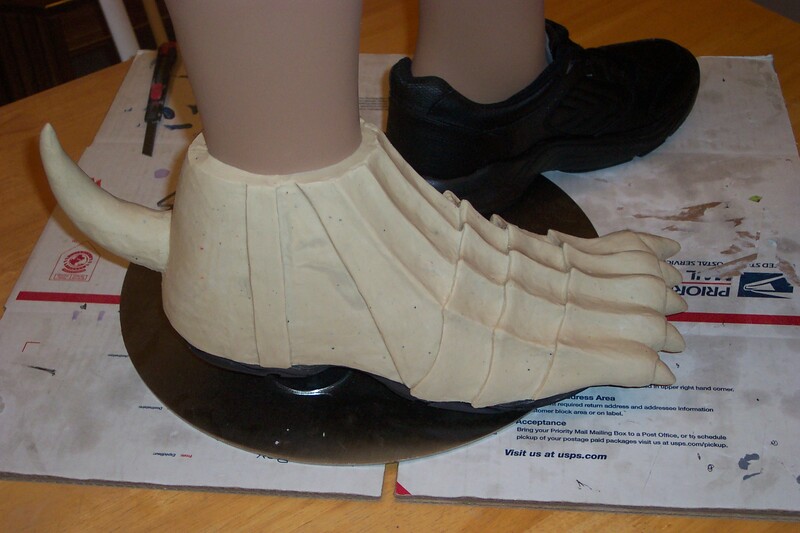 Once I had a mold for the spike coming off the back of SK’s boot, I used multiple castings of that spike for the knee guards. 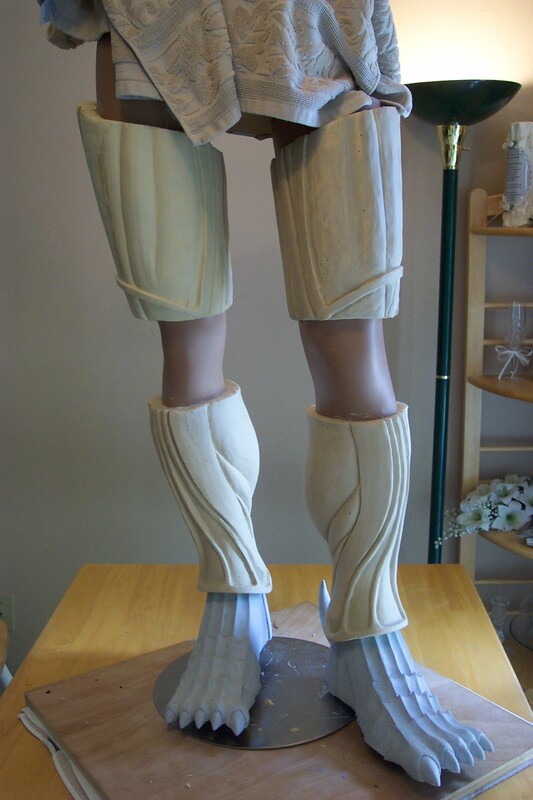 A mold of the completed knee guard was then made for fiberglass reproduction. Once again I took the 1/10 scaled measurements of the statue and converted it to 1:1 scale for the sword and shield in this case. Zero clay work for these parts, but after fabricating each piece I made a mold, of course, for both of them. 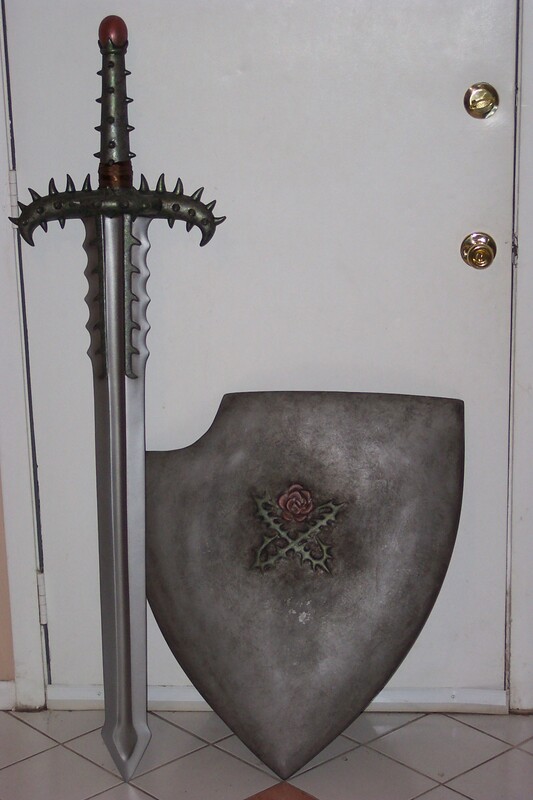 I had success with making only half or one side of Guts’ Dragon slayer sword and molding it so I was able to cast two parts and put them together, therefore, I repeated the same concept with Skull Knight’s sword. 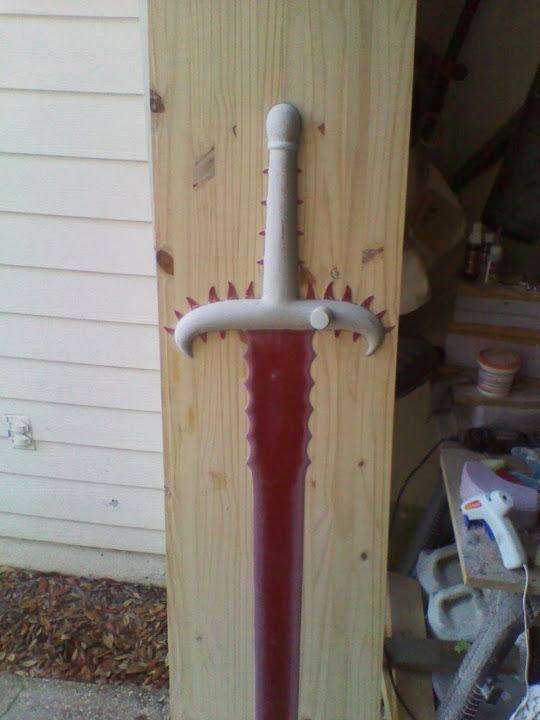 The hilt for the sword and the build up down the thickness of the shaft of the sword was a foam base fiberglassed and finished with bondo. 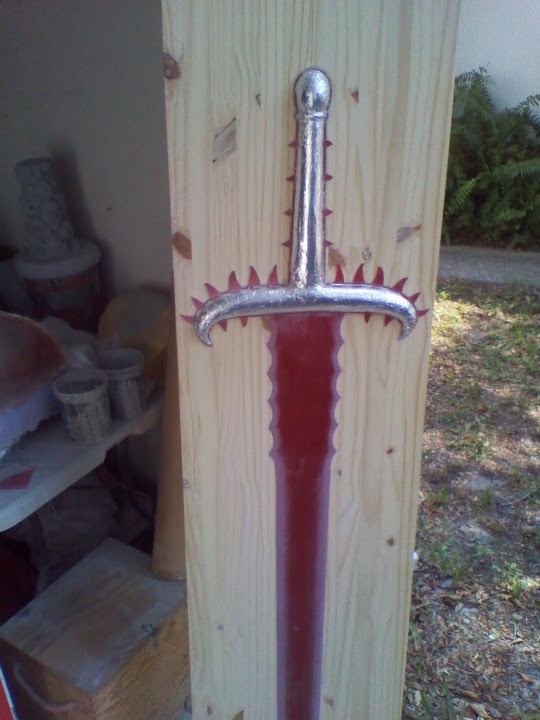 The thorns on the hilt was added with Apoxy Sculpt. See pics below. 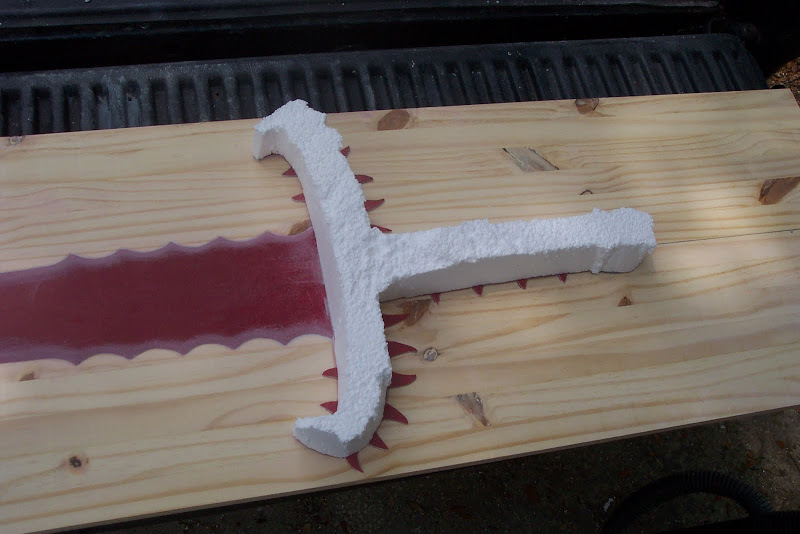 Hilt for Skull Knight Sword from Berserk manga made out of EPS Styrofoam. 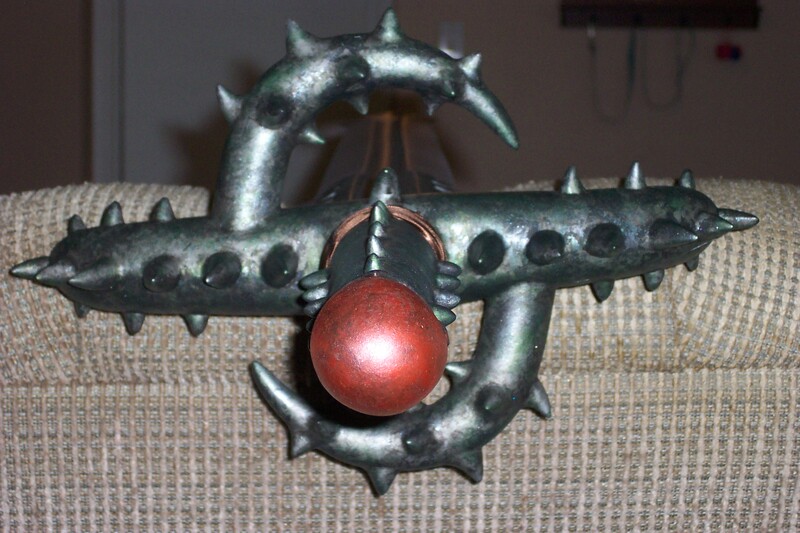 Top view of Skull Knight sword showing double half round thorns not part of main mold. 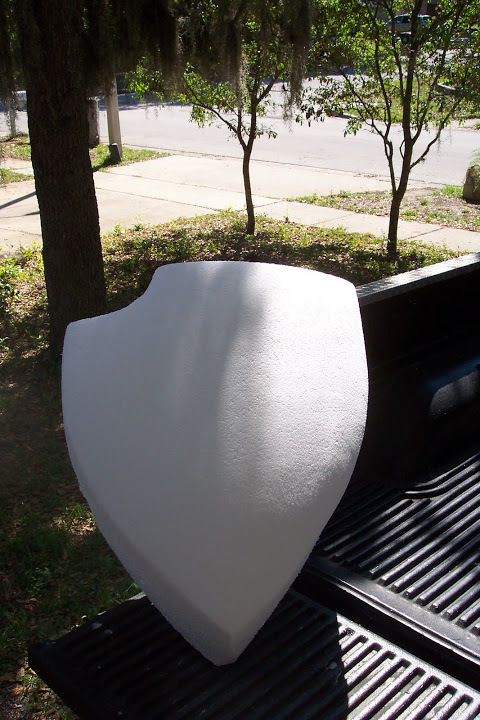 The shield started out as EPS foam. 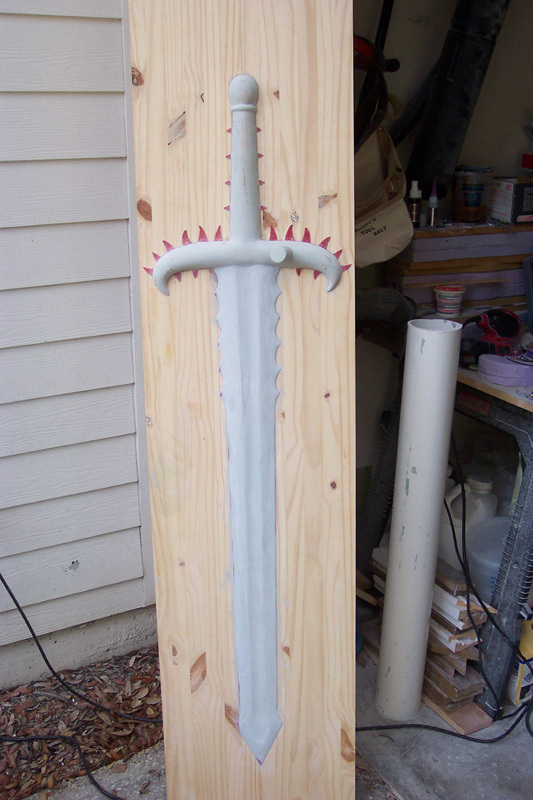 Once I had the right shape and size, I glued aluminum foil with spray adhesive over the foam to protect it from the resin melting it away during the fiberglass process. After the fiberglass fully cured and hardened, I bondoed and sprayed high building polyester primer over the finished sanded bondo and sanded, sanded and sanded even more to get it perfectly smooth. 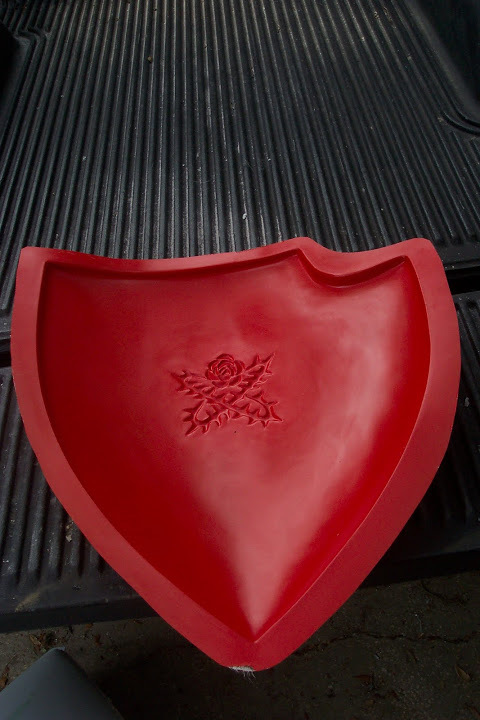 The thorny rose emblem on the center of the shield was added with Apoxy Sculpt. 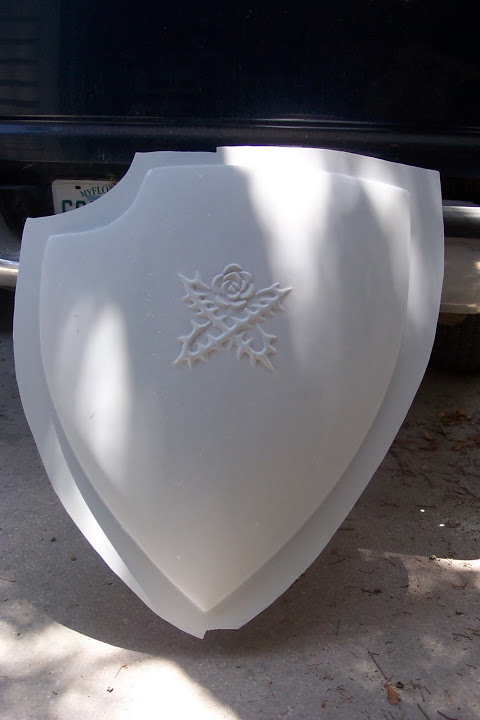 The shield mold was a fiberglass hard mold instead of silicone. I just had to wax the heck out of it and made sure there wasn’t any “locks” in the sculpture. 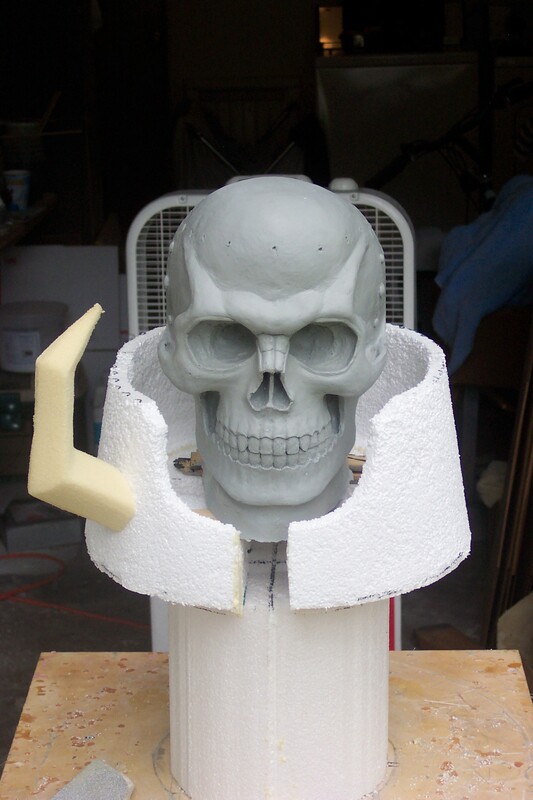 Four inch block getting ready to carve Skull Knight from Berserk shield. 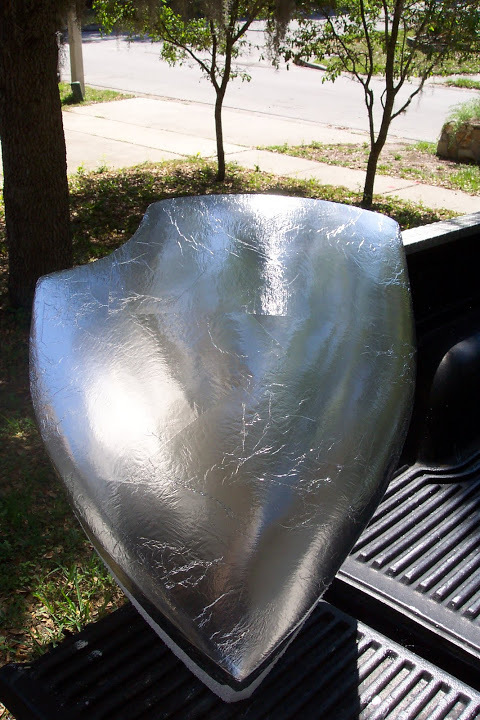 Foam shield covered in foil to protect foam from solvents and fiberglass resin. 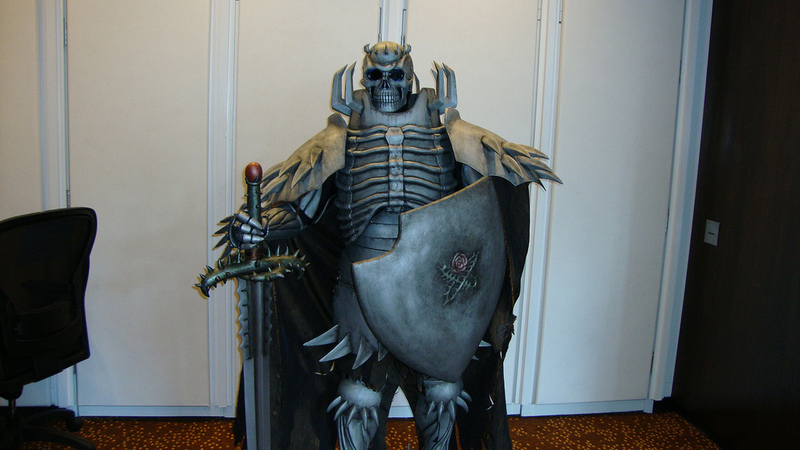 Skull Knight Fiberglass Armor and Weaponry from mold, painted. I took my experience of making a complete Star Wars clonetrooper suit and applied it here with SK’s armor. 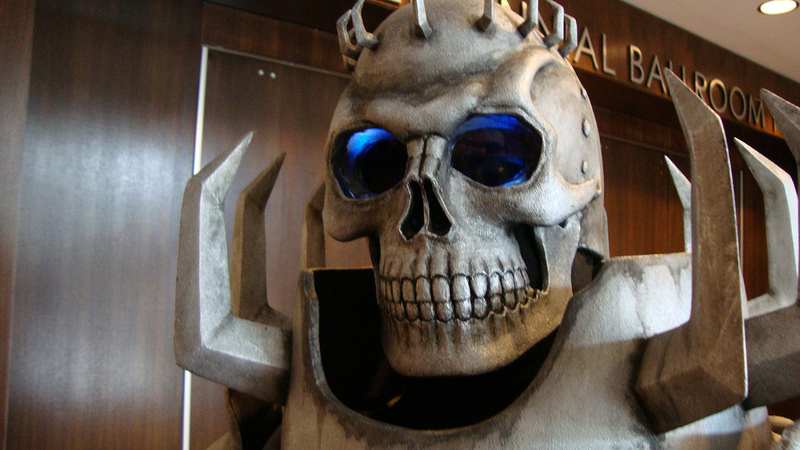 Much of the same concepts, materials and applications were used to make Skull Knight a successful cosplay. Below is a simplified drawing of the strapping system used on both the clonetrooper and Skull Knight. The blue straps represent 1″ non-roll elastic (black). The black straps are 1″ black webbing. Red and yellow is for 1.5 ” heavy stretch elastic (black). The belt made of the black 1″ webbing material is fitted with a parachute buckle and the end straps have the female portion of 5/8″ metal snaps where the male snap sections are epoxied to the cooresponding inside surface of the armor where the strap connects. 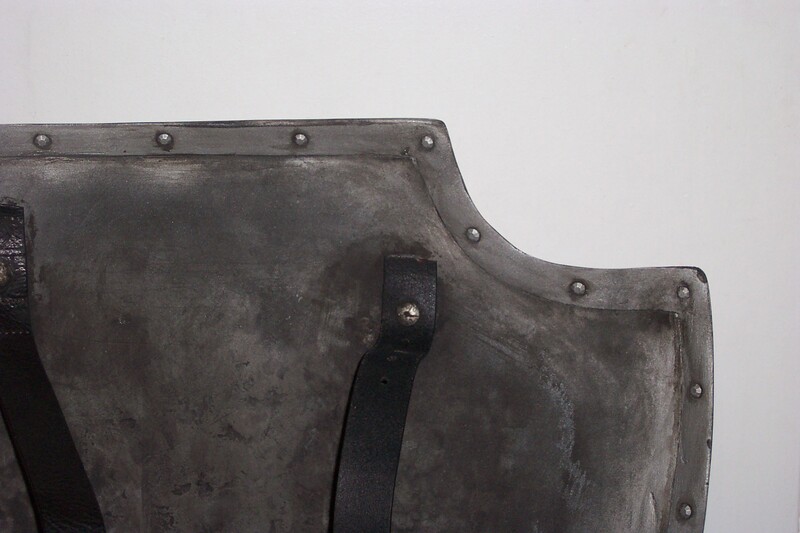 The stomach and back scale armor is worn being held up by suspenders made out of the 1″ non-roll elastic. 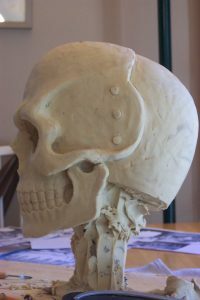 The spiked collar and the connected rib cage not represented her is just a slip-on over the head, resting on the shoulders with foam for comfort to inhibit the weight. 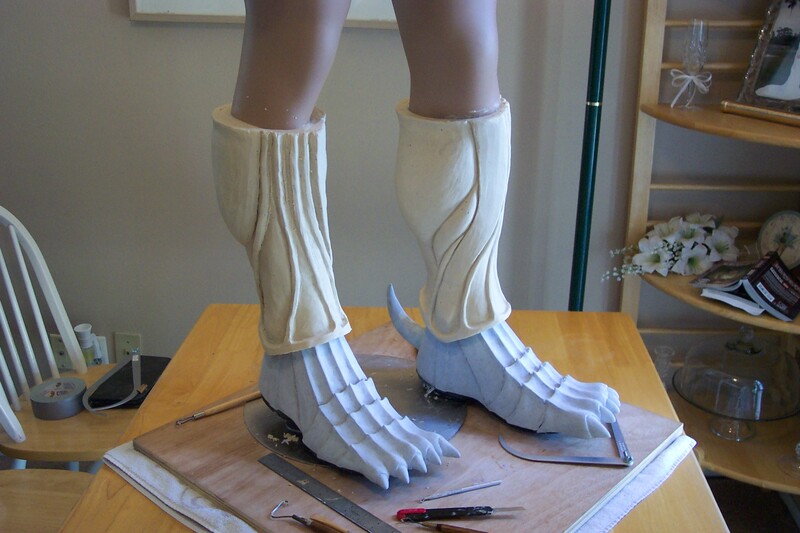 Other materials used to facilitate functional costume fabrication were as follows: super glue, Velcro, epoxie glue, cushion foam for padding, hot glue, rivets, grommets,string laces, and leather belts. 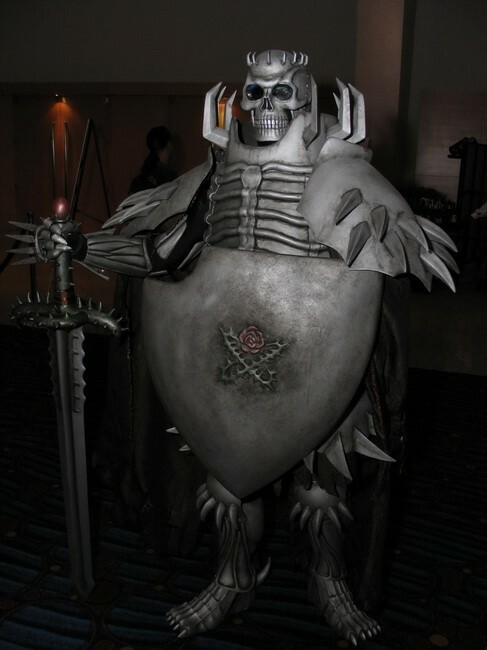 Another very important part of selling this costume is with the very first thing the cosplayer will put on before any of the armor and that is a full BLACK one piece lycra spandex bodysuit with hood and jaw cover so that any exposed body part not covered by armor appears black and unnoticed. But first before the armor gets fitted on a real body, Trent the mannequin gets the honors of putting on the suit of armor for the first time. I’d like to share with you one of my favorite tricks when I go to surface armor builds before painting. 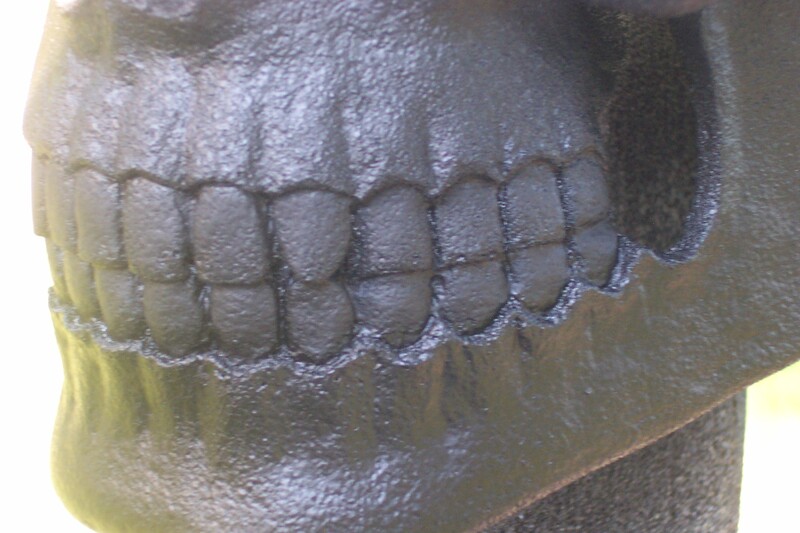 It replaces the use of primer and leaves a good hammered/weathered effect to the costume. The product is called rubberized undercoating for automotive use. My first step before painting any weathered armor effect. It sprays on black with a bumpy texture and dries quickly so it doesn’t run or drip. 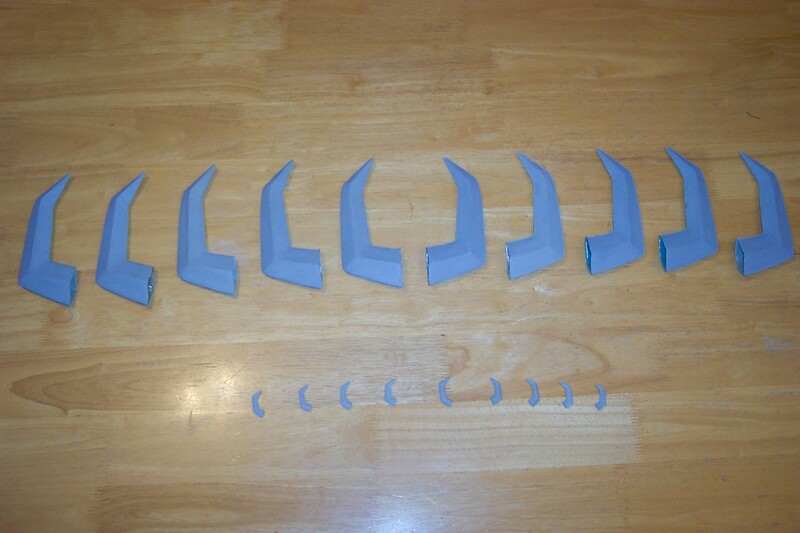 The adhesion is incredible and paint sticks to it as well as a good primer. The texture is that of a hammered metal look and helps with the dry brushing step in the paint job. Close-up of texture from rubberized undercoating. A total of only four colors was used to achieve the finished costume (with the exception of a few more colors for the sword and shield). Modern Masters Iridescent Silver (opaque formula) – First coat sprayed on over entire armor. Acrylic latex Burnt Sienna and Black with a touch of the Iridescent Silver mixed with 65% water – A brushed on dark “wash” in sections immediately wiped off with cotton rag for dark recess accent appearance. Acrylic latex White mixed with the Iridescent Silver – Dry brush technique accenting high points and hard line detail. Skull Knight helmet front view after dark wash technique. I found a terrific drapery material at Joann Fabrics that was light and had a good texture that matched the SK model I used for reference. It was important that I ripped and fringed the bottom of each the cape and the kilt to give it a worn, aged look. I had to tear it and not cut, because cutting with the scissors is too obviously square cut and clean. Both the kilt and cape were cut to size and female snaps were installed several inches apart at the top inside of the fabric and the male receiving snaps were superglued at the corresponding points inside the armor for installation. I used thin black liquid leather dye to darken the drape fabric. 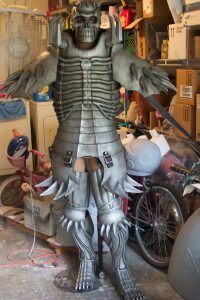 A VERY important step when getting ready to fit the armor on a person with this particular costume, made of fiberglass, is making sure it’s clean and devoid of any sharp burrs of glass and fiberglass dust. OUCH and ITCHY! 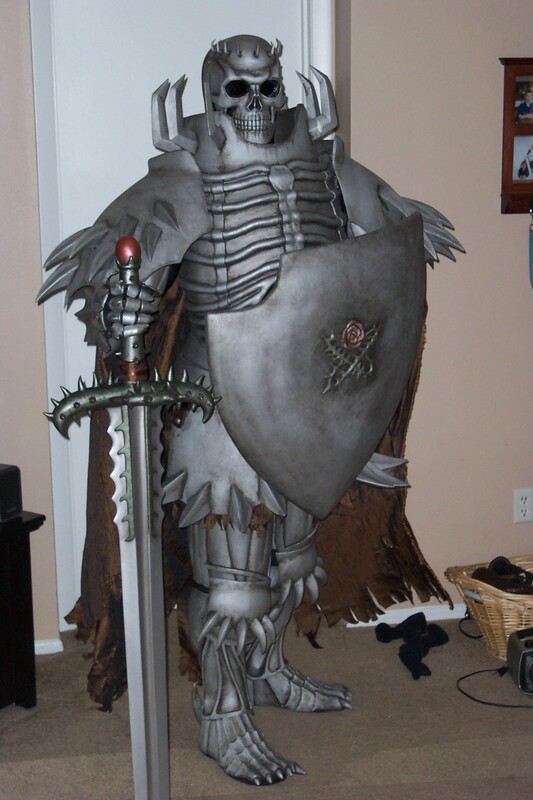 The Cosplayer sporting this armor has to have a handler with them. 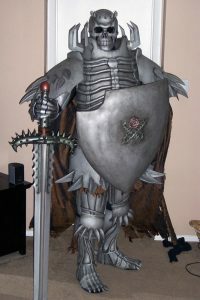 The legs and arms are easy enough by themselves, but the collar and rib cage with attatched shoulder spiked armor has to be carefully slipped over the head. 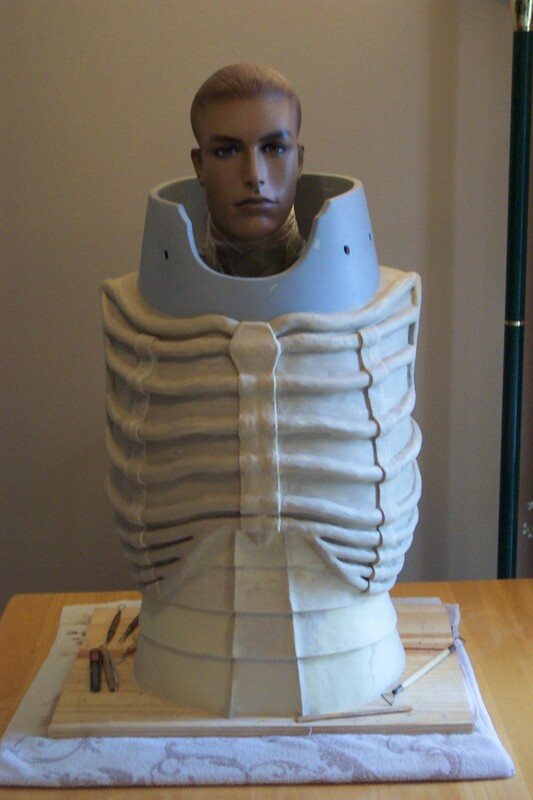 The opening of the rib cage/spiked collar armor is large enough for the person to have put the helmet on first, but if he so chooses to wait until after slipping on the chest and shoulders, the helmet will need to be put on by the handler. Arm reach is limited with everything on. 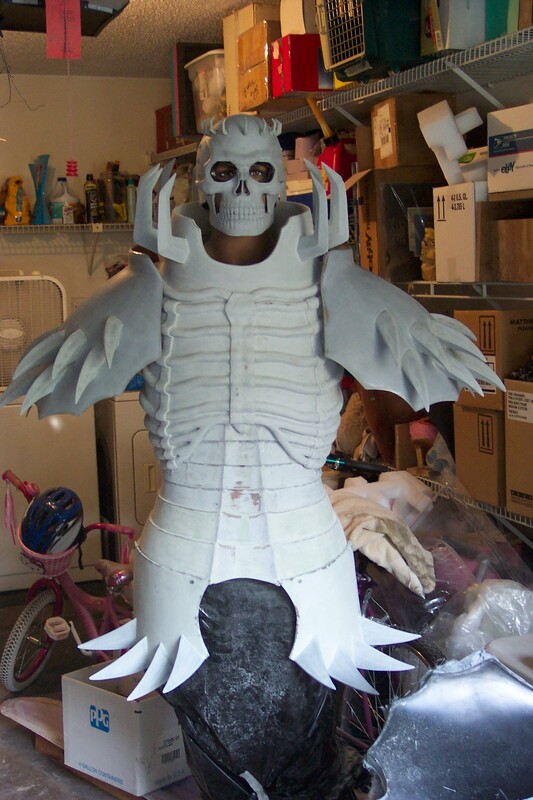 First test fit of Skull Knight fiberglass armor. 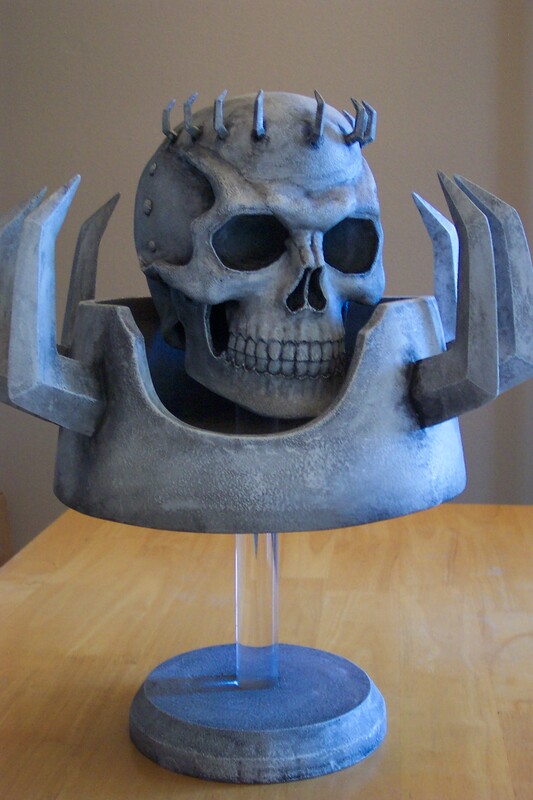 Skull Knight helmet close up.